It has been cold and miserable here this week. The rain has been pouring, the heating has been turned on and my mind has ambled slowly but purposefully towards Christmas and all of the fun festive activities we can start to enjoy! I decided to kick start our festive activities with a good old contact paper activity. Meet our Snowman! To prepare this activity I drew around two dinner plates on the non sticky side of the contact paper to make a snowman shape. I used a Sharpie to do this. I then peeled back the paper to reveal the sticky side. Leaving the sticky side facing out, I taped Mr Snowman to our window. 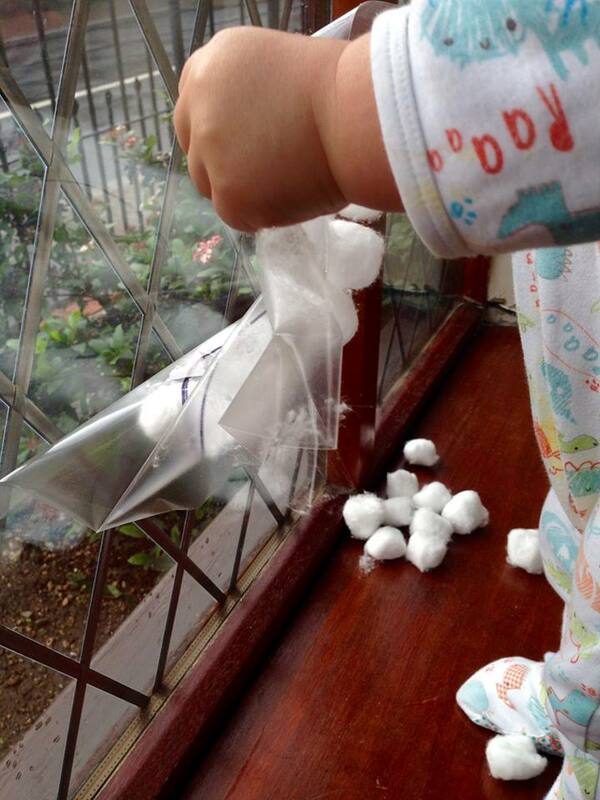 I left a pile of cotton wool balls on the window sill ready for Buddy to discover. 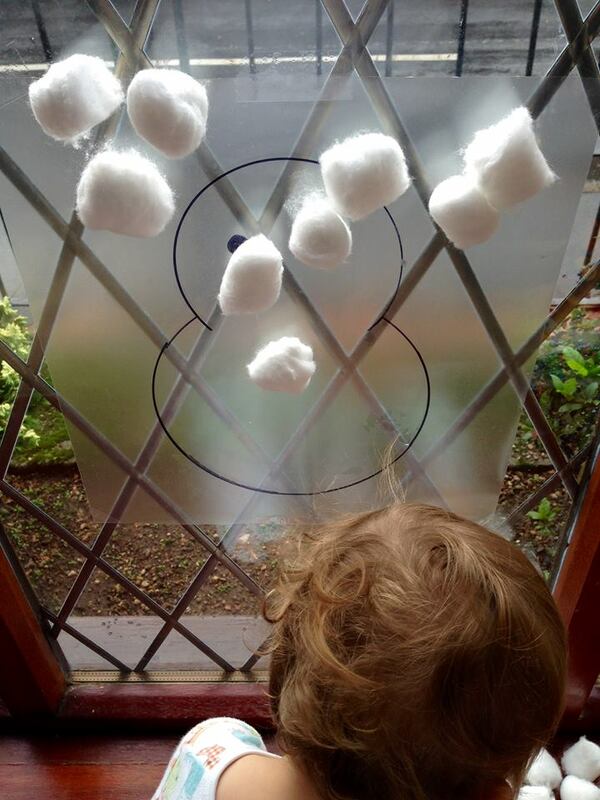 Buddy was immediately intrigued by the cotton wool balls. He has never touched these before due to due his tendency to eat things he shouldn’t, however he has (very) recently started to follow our “not for eating” instructions which is opening up lots of new avenues for play! 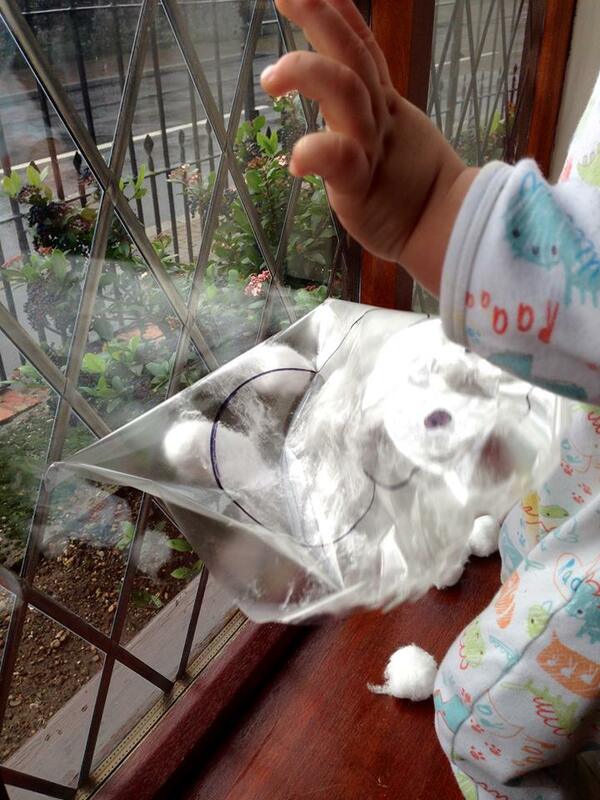 Buddy was delighted to see that the cotton wool stuck to the contact paper. 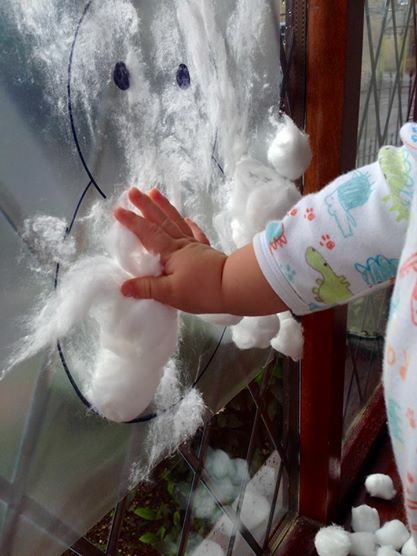 He pressed his hand against the sticky plastic repeatedly and enjoyed the resistance when he pulled his hand away. Our Snowman was looking pretty great, although Buddy was keen to see how it would look de-constructed too! 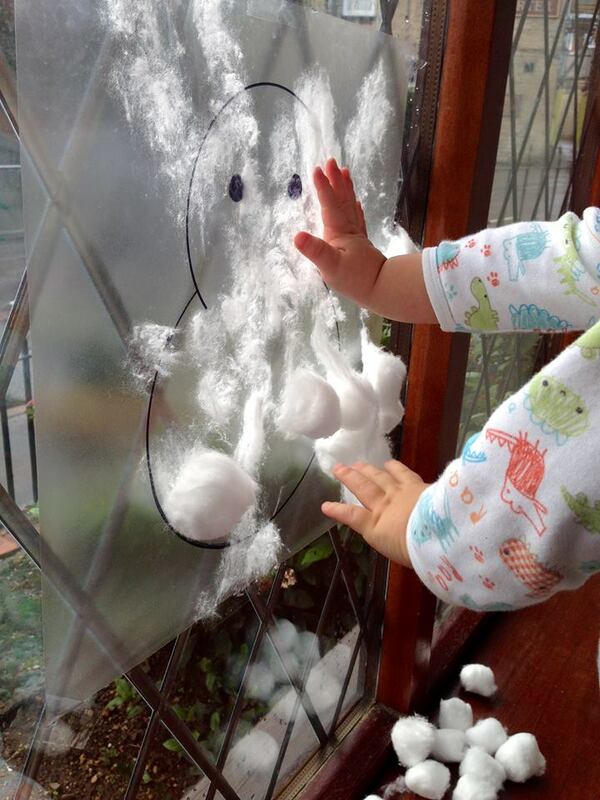 He had great fun pulling the cotton wool balls off again, and feeling the fuzz they left behind. 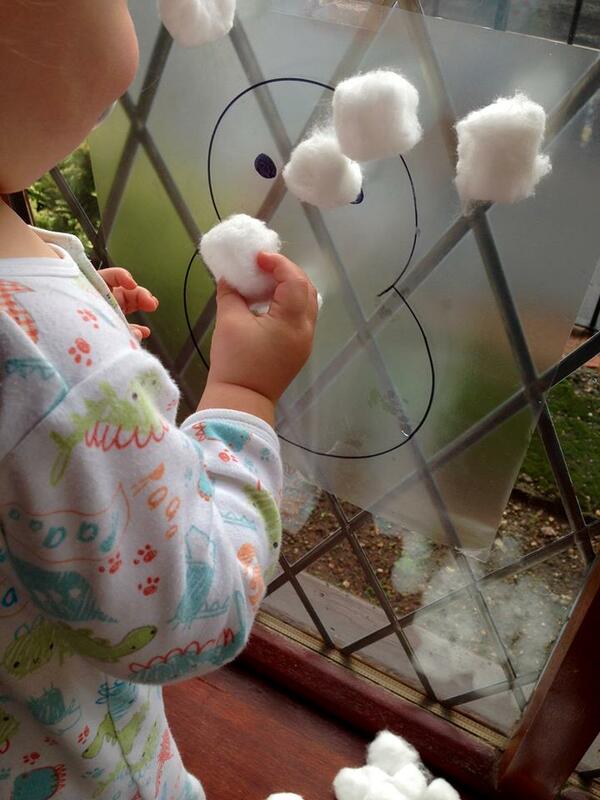 Buddy did a great job adding and removing the cotton wool and he made the Snowman look like he was in a snowstorm! However, after a while, the cotton wool wouldn’t stick any more and Buddy was bored of trying. It was clearly time for him to knock the snowman down! 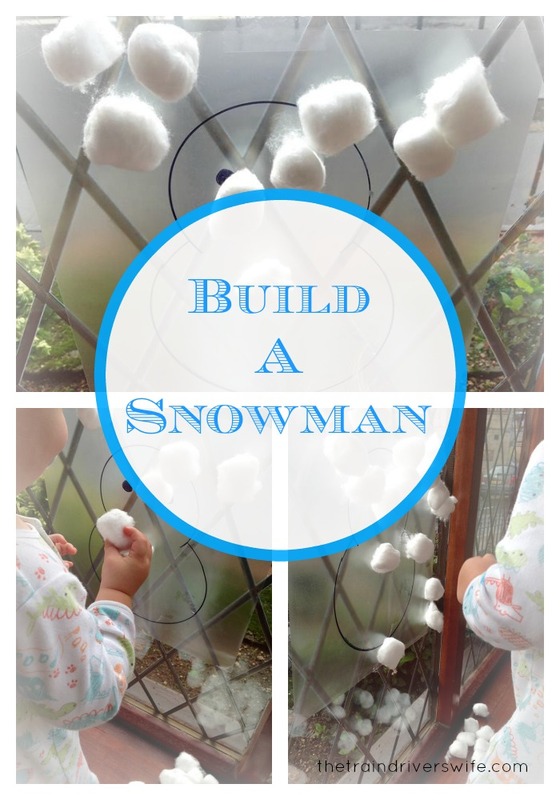 Buddy’s snowman didn’t make it till Christmas, however he had great fun building it and knocking it back down again! He experienced and explored new materials and played independently too! Not bad for an afternoon’s work! This was a great opportunity to allow Buddy to lead his play and to make his own decisions as to how he wanted the finished product to look. Was it how I imagined it? No…. But Buddy had fun, and that matters! That’s an absolutely fabulous activity. I am somewhat sensory avoidant on my hands but would love to try this to overcome my sensory issues. How did you add the (carrot) nose and eyes? That’s a great idea! I think I’m going to try that with my son. Pinned! Glad you enjoyed it Tricia!